Ki testing is a team sport but it is not a win/lose sport. 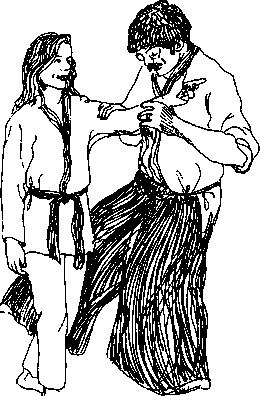 Many who try ki tests "fail" because uke saw himself as opponent and attacker, rather than as a teammate serving as a useful biofeedback device. I once annoyed a partner by failing to fall over for kokyu-dosa\ his solution was to punch me in the ribs. I did indeed fall over, but the point ofki testing is not whether nage can miraculously survive a punch or kick "by extending kiThat is not a test, it is an attack. The point of ki testing is to find the points where nage is a little stronger, a little firmer, able to hold a litde longer — and work up from there. Suppose a friend is baking a cake and asks you to check to see if it is done. Test One for doneness in a cake is to gently tap the surface. Is it still raw batter that gives way to the slightest touch? Smashing the cake with a punch does nothing to help its progress. You have not "won" anything, and have been of no help at all to the friend (or the cake). "An interesting idea," said Jan, "but I don't cook so I really don't know quite what you mean "
1 Excerpted from Aikido Exercises for Teaching and Training by C. M Shifflett has developed the necessary strength to bear the load9 When the weight of the overlying brick causes the half-set concrete to fail, do you say "Ha-ha11 win' My bricks beat your footings!" 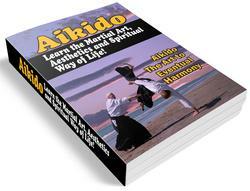 One thing that came to mind while I was looking for an example is that you also need to keep sensing subtle changes in the power that is coming towards you (or pulling away), no matter how strong it is Some people seem to think that it's a choice between softly stroking or hard slamming (the "aiki-fruity" approach versus the "Butch-macho" approach). Jn trodiuzHon fCi testing also has other applications. Several members of our dojo volunteer weekly at the local juvenile detention center and teach ki classes. There, little short women demonstrate Unbendable Arm with the biggest, toughest kids there. When they cannot bend it, they are astounded, aghast! "Do you lift weights, or what?" They are teaching a different kind of strength. Whatever you call it, it is useful even for the children at the county detention center whose punches to the ribs or attacks to those whom they found annoying is no longer an option. Many are there because they tried that approach once too often. They've heard all the lectures. Just how well those have worked is made quite clear by their presence there.